Risk management is more than just buying insurance—insurance is just one method used to transfer your risk and protect your assets. The Roberts Agency can help you broaden your perspective to consider other risk management techniques. Simply put, risk management involves evaluating your exposures to risk of loss by an accident or occurrence and what steps are available to you to minimize this potential and are acceptable to you. First, you must identify and analyze your exposures. 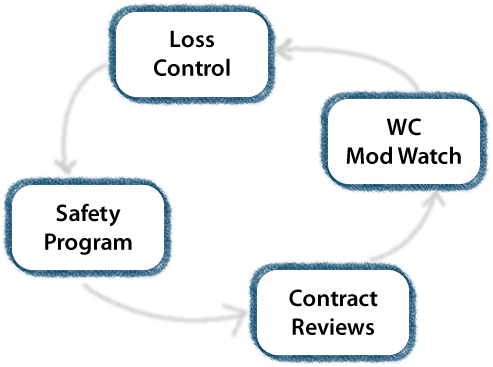 Then, you should select the appropriate risk management technique to handle the exposure such as retention, contractual or non-insurance transfer, loss control, avoidance, or insurance transfer. Whether your account is large or small, we can utilize our experience to assist you in the process of making rational, common sense risk management decisions. Loss containment translates into lower premiums. Negotiate lower reserves; securing recovery when available. Accuracy analysis projections based on loss control. Our strategic loss control plan has helped contractors to bid and secure jobs they wouldn't have otherwise gotten. Risk Transfer—additional insured; hold harmless; waiver of subrogations. Are you in compliance? Are you adequately protected? Do you have a safety manual in place? Do your people have OSHA 10 or OSHA 30 training? The Roberts Agency has been servicing Dayton Construction Company, Inc. since 2002. Their professional staff exhibits expertiese and continuously provides detail oriented customer service, which is unmatched in the commercial insurance industry today. SANDRA SAKI, Vice President, Dayton Construction Company, Inc.
Have you applied for your Workers' Compensation CT Contracting Classification Premium adjustment credit? If NCCI does not receive your application within 180 days of policy inception, your premium calculation will not reflect any possible premium credits. © 2018 The Roberts Agency, Inc.